The Danish designer has lived in Los Angeles for 15 years and gives Vogue her city tips. What is your favourite part of Los Angeles? Where is your favourite place for breakfast in Los Angeles? Where is a fun place to eat out in Los Angeles? What are your favourite places to go shopping in Los Angeles? “Rose Bowl. It is THE best flea market in town and I can spend hours there looking for cool vintage t-shirts, boots, candle holders and furniture. Are there any places in Los Angeles that are off-the-beaten track? “You should definitely take the car and drive up the coast. Make a stop at Point Dume and walk down to the local beach there. It’s quiet and so so beautiful. The water is turquoise and there is always dolphins and sometimes whales to be seen. Where are your favourite vintage and markets in Los Angeles, and what do you buy from them? Where are your beauty places in Los Angeles? Where would you take a tourist for their first time in Los Angeles? Out of the tourist spots in Los Angeles, which are the best ones to go to? How would you describe LA style? How has your personal style evolved since moving to LA? Marianne McDonald on her label McGuire and the perfect pair of jeans. I can’t stop wearing my Inez Patch Flares in Kansas City, named after the favorite hangout of David Bowie and Bebe Buell. 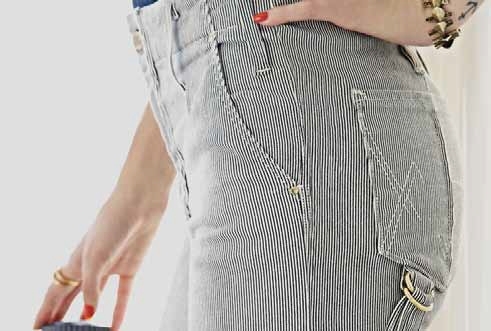 For these we took our cues from classic patch pocket pants from the 60′s and 70’s. The welt pockets at the top and just a peek of gold hardware hint at the decadence of that era.What do you try to accomplish with every season? I’ve always loved the idea of a glossy take on heritage denim. My design team and I are inspired by the concept of clothing being able to make your life better. A bit more glamorous, a bit more fun…for Spring we have our fringe legging in Ponyboy. I love seeing the girls running around the office with a half tucked tee with the swish of fringe ready for post-work festivities.Why did you choose to design and focus on jeans? Denim is one of the only mediums in fashion that you beat up, knick, sand, and bleach in the hopes of being able to tell a story and illustrate a past, present or future that you imagine. That, combined with the ability to magically look like you have the bum of a ten year old…and legs for miles doesn’t hurt either. There’s a moment in the dressing room when you’re trying on some fantastic piece and you imagine how owning it will transform your whole life. When we’re in fittings I make sure the model has officially been transported to Lake Como with her lover, Giovanni. Denim style that you wish you could resurrect from the grave. The first-ever created jean from Nimes, France. Having lived in New York or L.A. for most of my life, I’m naturally drawn to these cities and I like the idea of creating a wardrobe that translates well in both. Mick Jagger and Jerry Hall. He’s a chameleon and she’s Jerry Hall. While traveling in France, Marianne visited Nîmes- the birthplace of denim in the 1500s. It is there, after continually seeing the city’s motif of the crocodile chained to the palm tree, that she decided it would be the inspiration behind the button of her soon-to-be denim collection. The collection is made completely in Los Angeles with stretch fabrics from Italy and Turkey. In a former life, Brett Heyman was Gucci’s director of public relations (who also held stints at Elle, Giorgio Armani and Dolce & Gabbana). Now? She’s the designer behind Edie Parker’s cool Fifties- and Sixties-inspired clutches. It was an accident really. I had no intention of starting my own line — I just wanted to remake the vintage acrylic clutches I could no longer find because I loved wearing them. Every time I wore a clutch someone stopped me to ask about it. There aren’t a lot of brands that focus on evening bags, so I got to work and here we are! Edie Parker is my daughter’s name. But, yes, there have been many chic Edies! I have a picture of Edie Sedgwick hanging in my office, and I have watched Grey Gardens more times than I care to admit. What do you love about the Fifties and Sixties? I’m absolutely drawn to that period of postwar America. Fashion, architecture and design began to experiment with new materials during this time. American fashion was setting trends globally, and part of this innovation was the use of plastic, acrylic and metal. Who are your style icons from that era? There are too many to name. Pretty much if you were French and in fashion in the Sixties, I love your style! Loulou de la Falaise, Charlotte Rampling, Betty Catroux. I’m also always referencing photos of Babe Paley, Gloria Guinness, Marella Agnelli, Diana Vreeland, Slim Keith, etc. These are women who clearly loved getting dressed and were passionate about their accessories. What’s the best fashion advice you’ve gotten? Wear a garment, don’t let it wear you. Oh, gosh — I could use some! Is Tory free to talk? Charles Schwab once said — and obviously not to me — that “a person can succeed at almost anything for which they have unlimited enthusiasm.” I think that’s a great thought. The most exciting part about owning your own business? Freedom, creativity, creating a culture. Freedom, creativity, the pressure to create the right culture. Lessons learned from your previous jobs? I have had amazing experiences. Being in the proximity of Tom Ford, Domenico Dolce and Stefano Gabbana, and Frida Giannini was exciting. They radiate energy, passion and talent. Following your passion is a great lesson. Hopefully a lot! I am working on some bags that combine acrylic with skins, leather and other materials. I am working on new shapes and new sheets that are digitally printed. We are launching fantastic acrylic hinged bangles and I hope to continue making jewelry. The list of what I want to make is limitless! Norma Kamali could teach a college course on the history of sweatshirt dressing. Perhaps that’s because she was an early architect of the sporty trend, which has gained major traction in recent years. At a preview of her latest Spring lineup, Kamali pulled out a scan of an archival WWD spread from 1980 featuring staff members modeling her terry separates, which were revolutionary at the time but would fit right into any glossy editorial spread today. “I thought I’d had it with sweats. Then I started getting all of these requests for them again because that’s what girls are gravitating towards now,” said Kamali. “So I decided to reintroduce them in a modern way. After all, activewear is a big part of my brand’s DNA.” This season, the designer demonstrated just how versatile the athletic staple can be, whipping up easy cotton hoodies, tanks, and crop tops equipped with classic kangaroo pockets. She also showed a variety of pieces cut from the same soft material, including fishtail maxi skirts, rhinestone-studded midi dresses, and bomber jackets with billowing sheer sleeves that definitely weren’t intended for the gym. Case in point was a white racerback tank gown done in a thinner technical jersey also used throughout Kamali’s Interactive Active sub-collection of workout apparel. It hugged all the right curves and was the kind of thing you might picture Maria Sharapova getting married in. While competition is steep in the novelty sweatshirt market these days, Kamali proved that it’s hard to beat an original. Perhaps, in between designing collections for women and men, kick-starting an ever-growing accessories division, and pursuing a global expansion that’s going at a rapid clip, Rag & Bone’s David Neville and Marcus Wainwright could write a quick how-to guide on successful brand building. But since they probably don’t have the time for that, let me do it for them here instead. Their message would likely boil down to this: Know Who You Are, Know What You Can Do, Then Just Do It. Neville and Wainwright clearly already know all of this, because they did just do it, if their incredibly strong, persuasively focused, and brilliantly direct-in-its-appeal fall collection is anything to go by. It was dressed up but also casually downbeat. It had newness but also familiarity. It borrowed from the boys, but also sent it all back to them, because Neville and Wainwright realized they could come up with something better for the girls. The “girl,” their “girl,” is, of course, important to them. It’s who they talk about, who they design for, who they want to bring into sharper focus from the corner of their eyes. Oftentimes, designers will talk about their “girl,” and you don’t think she ever existed beyond the fancy of a design studio. But the Rag & Bone girl is everywhere you look, living downtown (even if in reality that’s more of a state of mind for her than a reality), standing beside you on the subway, going on a juice detox, watching Girls, getting drunk after said cleanse. In short, a living, breathing, fun creature that they have learned to dress instinctively, and rightly.Backstage, Wainwright and Neville talked about what had inspired fall. The notions of sixties minimal-chic air travel that then morphed into fighter planes, hence the mix of a short, graphic, texture-rich (quilt-effect stitching abounded) look fused with utilitarian detailing (drawstrings, leather ribbed banding). Skirts were super-abbreviated, collars on sweaters stood away from the neck or rolled over, an homage to Camelot-era Jackie, while the coats were superbly worked—in particular, a green trench whose sleeves were articulated the same way as an airforce jacket back in the forties, and which took ten go-rounds to get right. The color palette was lifted from the airplane world, too, fusing darkly somber, military service shades of black, gray, and olive, contrasted with a judicious use of deep purple, seafoam green, and a flash of an orange that originated from the lining of a MA1 flight jacket. And, because they’re both English, their nationality came into play, too, with a disrupted Prince of Wales check that close-up looked like it had been rethought by Bridget Riley. With all this, they wisely kept the styling to a minimum—a slash of black at the eyes, dark thigh-highs, and one of their pilot bags, patched in leather and synthetics, firmly grasped in hand, and looking as coolly compelling as most everything else here. In the sea of traditional American sportswear that’s been New York Fashion Week, the boys over at Rag & Bone stand apart with inspirations that are clearly from other shores. Vests with hanging watch fobs, scarfs as cravats, greatcoats and brocaded evening jackets were all a far cry from the campus quad fashions and heritage brands being shown around town. The gentlemanly trappings were grounded with officer’s boots and military-inspired pieces that gave the collection proper heft. 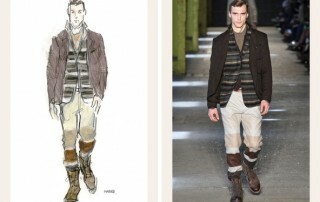 A blanket striped jacket (more Welsh than Hudson Bay) in earthy neutrals layered on top of a vest, underneath yet another jacket and paired with wider wool trousers, looked enviably wearable and still runway worthy. Though the official kickoff comes on Thursday, with more than 300 designers presenting their spring 2013 collections at Lincoln Center, Milk Studios and other spaces around town, New York Fashion Week has already begun in the minds of the designers, journalists, buyers and followers. Visit the Fashion and Style section of The New York Times daily for continual fashion week coverage, on and off the runways. Here’s what to expect from our reporters and editors. • Ruth La Ferla’s Trendspotting reports. • Scene roundup posts from Bee-Shyuan Chang. • Intersection: Where Culture Meets Style videos. • The Moment blog from T: The New York Times Style Magazine. • Model-Morphosis interactives, The Daily Shoe and more, from T.
Here’s a preview of what’s in store on the runways this week. 2012 has been quite the year. We’ve waited for Carly Rae Jepsen’s phone to ring since what feels like forever, we developed major girl crushes on Girls director/writer, Lena Dunham, and we felt like we’d never be as cool as Azealia Banks. Jepsen, Banks and Dunham may have rocked our worlds this year, but in the world of fashion, important things that have gone down too. There have been soaring highs, crashing lows, and shocking changes for celebrities, designers and even journalists. Designer shifts at Balenciaga and Dior that are just a sampling of what seems like an endless list of fashion shakeups that went down over the past 12 months including Stefano Pilati and Hedi Slimane at Yves Saint Laurent, YSL becoming simple Saint Laurent Paris and more. And speaking of shakeups, Kristen Stewart’s rise from a teen queen to a heartbreaking fragrance face has been epic to say the least. So let’s look back, reflect, and count down together the events that made 2012 so real. It’s been a couple of months since we first feasted on Prada’s Spring 2013 collection, but any weariness of those toe sock/thong shoes has all been washed away with the just-released spring campaign. Simply put, Prada’s Spring 2013 collection was a whole lotta Japan-meets-sixties look, and it seems that streamlined styling was the name of the game for the Steven Meisel-shot advertising images. The modeling A-list amongst its stars includeRaquel Zimmerman, Saskia de Brauw, Eva Herzigova, Sasha Pivovarova, who all pose against stark grey backgrounds in furry coats, hot pants, daisy sunglasses and more. The flatform heels with the toe socks make a re-appearance but have been styled in a way that we know when Fall 2013 street style photos come pouring in, these shoes have the potential to shot day after day. “There is nothing girly or ostentatious about these blooms or these women, whose poses reflect their confident individuality,” said Prada headquarters in today’s press release. From a one of the more subdued Prada collections (think: pale pink structured silks and a whole lot of black), Miuccia has out-Miuccia’d herself and made this campaign more powerful than the trippy geometric images from Fall 2012. If this is “Prada’s new woman” we can’t wait to see what’s in store for Fall 2013.